An exclusive first glimpse of the Top Arts 2019 exhibition is on offer to teens with a special after hours event to be held on Friday 22 March 2019. From 5:30pm-8pm, teens will be able to view the exhibition and enjoy a series of pop-up talks by exhibiting artists. Celebrating its 25th anniversary, Top Arts is an annual showcase of Victoria's most exciting emerging young artists who have excelled in VCE Art and Studio Arts. Opening 22 March at The Ian Potter Centre: NGV Australia, Top Arts 2019 presents the brightest bourgeoning thinkers from across the state with 49 works drawn from over 2,000 submissions. Illuminating the pressing concerns affecting young Australians and the world at large, Top Arts 2019 artists explore a broad range of contemporary issues from familial grief transferred across generations, to the acceleration of climate change and the effect of consumerism on modern society. The exhibition showcases a breadth of mediums including painting, sculpture, installation, fashion and video art, highlighting the ingenuity and diversity of young Victorian creatives. 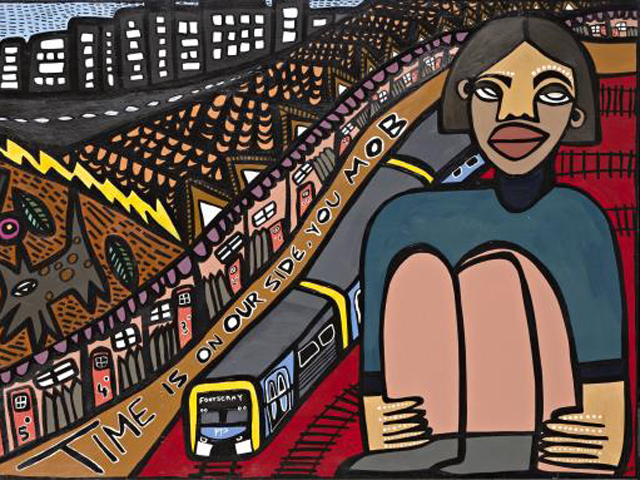 Highlights include Aretha Brown's Time is on our side, you Mob, 2018, a self-portrait exploring the impact of intergenerational trauma of the Stolen Generation on her life as a young Indigenous woman. Also touching on familial themes, Marcus Begutter's Wizened, 2018, examines how a person's mental state can change over time with portraits of his grandparents, one a war camp survivor and the other dealing with dementia. Drawing on cardboard with charcoal, both impermanent materials, Begutter uses this medium to imitate the fragility of life. Movement is translated into a tangible artwork in Storm Bell's Interaction Drawing IV, 2018, which has been created using his drawing machine made from a 44-gallon drum, paper and pens. The device responds to human interaction – powerful pushes, sweeping turns and abrupt stops – with ink marks on paper to create a visual interpretation of the motions made by the participant in a playful study of fate and coincidence. Kristy Fedoro's digital print, Little Racoon, 2018, is a tongue-in-cheek portrait of a young man with bright pink hair topped with a set of racoon ears. Incorporating bright colours and quirky features reminiscent of the artist's childhood, such as a rubber ducky earring, the work serves as a homage to nostalgia and childlike wonder. Wearable art features strongly in this year's selection with highlights including Nicholas Gilbert's STORM, 2018, a sculptural outfit of intertwining tubes mimicking a tornado, influenced by humanity's hand in accelerating climate change; Felt (past tense of 'Feel'), 2018, by Isabel Unwin, a bright ensemble embellished with knitted cords, created as a tactile expression for the abstract nature of mental health; and Rebecca Willington's jacket, Checklist, 2018, which juxtaposes neon pink squares with clear cut-outs, investigating how clothing can act as a protective social armour.